IN AIYON WE KNOW THAT EACH CLIENT IS UNIQUE AND DIFFERENT, LIKE SNOWFLAKES. OUR JOB IS TO ACCOMMODATE YOUR NEEDS. THANK YOU FOR THE TRUST PLACED IN US. 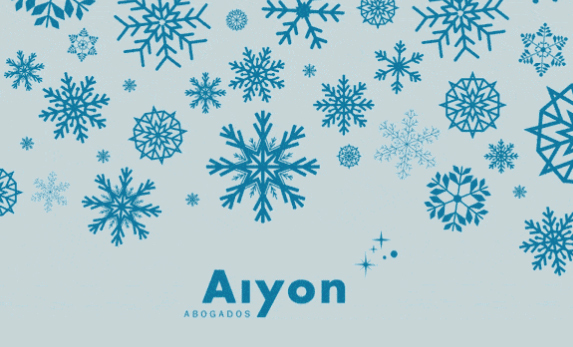 https://aiyon.es/wp-content/uploads/2018/12/aiyon-abogados-merry-christmas.jpg 347 573 Aiyon https://aiyon.es/wp-content/uploads/2018/10/aiyonabogados_logos.svg Aiyon2018-12-18 16:14:192019-02-07 06:52:18AIYON Abogados wish you a Merry Christmas!